You know how sometimes there are dishes that conjure up memories that are buried somewhere deep inside you? These potatoes… do that for me. You see these little perfect golden beauties are not new to my blog. They have been posted on my blog since I start blogging oh so very long ago…when my blog was here. Complete with horrible pictures and all. I have come a LOOOOONG way since then. 2008 wow…seems like light years away. I started planning my menu a month in advance. Trying to figure out the best turkey (mine is still the best by the way), the ultimate sides and the most unique of potatoes. Hubs thought that no table is complete without a potato dish. How Russian of him. It was my mother in law that introduced me to these golden beauties. We happened to be at her house for one of the high holidays when I noticed her removing the most gorgeous golden puffs out of the oven. They were resting RIGHT on the racks. “Strange” I thought…and made a mental note to buy the woman some baking sheets…poor thing. And then she brought over little ramekins of fragrant and warm garlic butter. My brother in law immediately grabbed two of them to himself and started dipping his bread into it…chomping down loudly and smacking his lips out of pure enjoyments after each bite. No he is not a toddler…he’s in his 30’s. His mom came by toting a platter of those beautiful little golden potatoes and smacked my brother in law on the back of his head. “That’s not what the butter is for!” And she immediately placed three of these golden puffs on his plate. To say that he was happy was an understatement. He continued chomping away on the golden puffs and raised a few toasts to his mom’s golden hands…exclaiming that this is the only thing he needs to eat that night. I begged to differ. And we began one of our many arguments of the night. We both loved to argue…sometimes over food..sometimes over movies…always ending in a good laugh or me smacking him upside the head. As we argued I proceeded to take one of these puffs and dipped them into the warm garlic butter. And I stopped dead in my tracks. These weren’t puffs! They were potatoes! 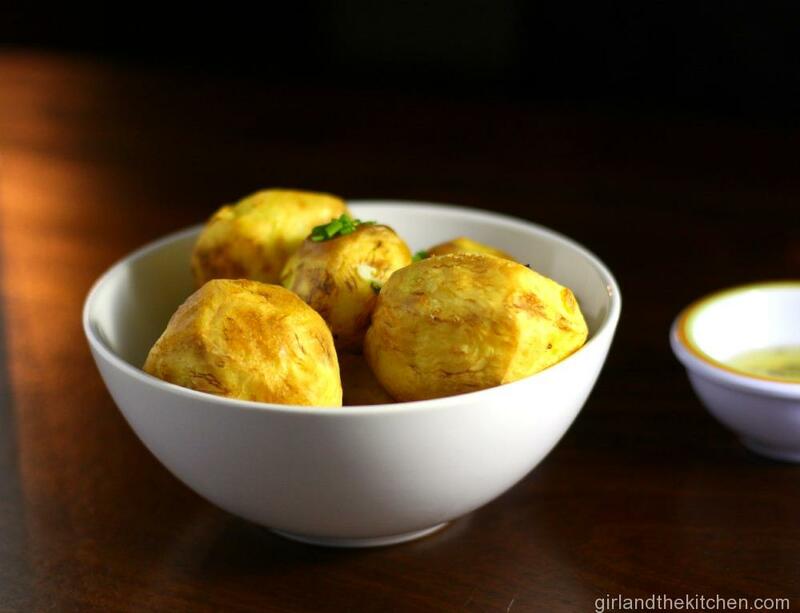 OMG…these round little golden nuggets were JUST potatoes! And combined with that garlic butter…they were magic. 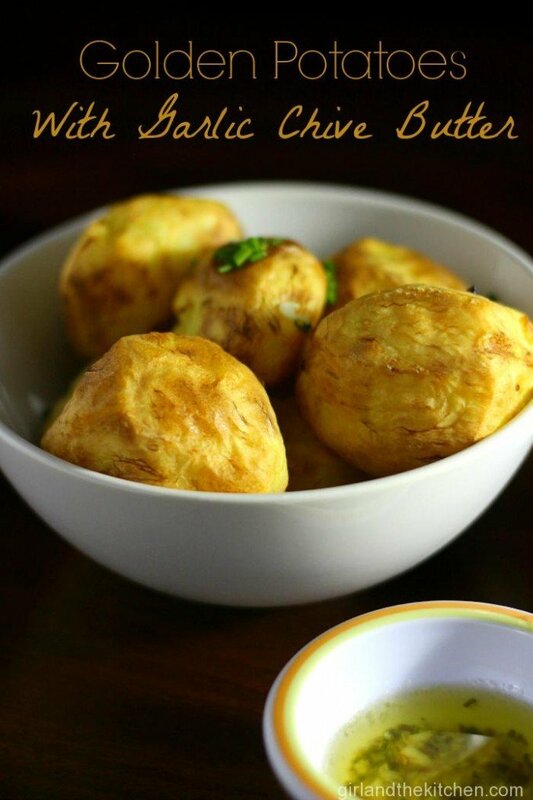 The ultimate potato dish were these golden potatoes! “Ella, these ARE POTATOES?” I asked my mother in law. “Da.” She said simply, with a proud smile on her face. “Amazing aren’t they,” she said. I am rarely speechless. But I was. How does this happen…without deep frying them? What could possibly happen to make these tiny balls of tater sunshine? I stared at it in my head…rotating it around to inspect it for any secrets I was not shared with. Funny, I didn’t see any salt on them, well with the exception of the salt that I had just doused them in. Hi my name is Mila and I love salt. She then explained that you simply parboil the potatoes in very salted water. Once they are fork tender, you pour them right over your baking rack from the oven and stick them into the oven until they are golden and deliciously crispy…about 20 minutes. Naturally, I went and created these for Thanksgiving and they were so perfect. Seriously…I think I made at least 40 for 20 people and there was not 1 left. NOT 1. I served them as an app and my family just devoured them. 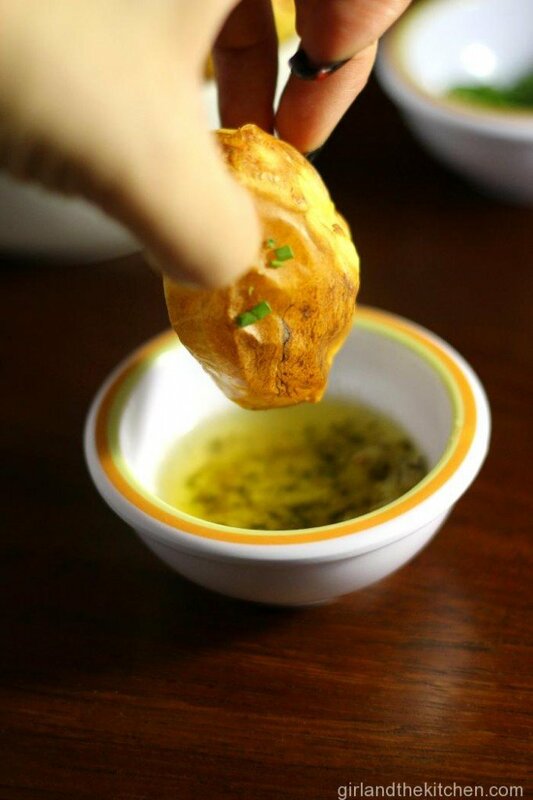 Dipping them into my glorious chive and garlic butter…begging for more. The coolest thing about this recipe is that you can make it ahead. I boiled these babies up a few hours before service. Drained them. Then left them in a pot covered with a towel so they stay warm and moist. Then once I was almost ready for the course, I placed them onto the oven rack and baked them off in a 450-degree oven. And they really were perfection. And no one will know how very easy they are. Take out two of your racks out of the oven and THEN preheat it to 450-degrees. Peel the potatoes and make sure they are no smaller than a golf ball and no bigger than a small tennis ball. Place racks CAREFULLY back into the oven into the oven for about 15-20 minutes. 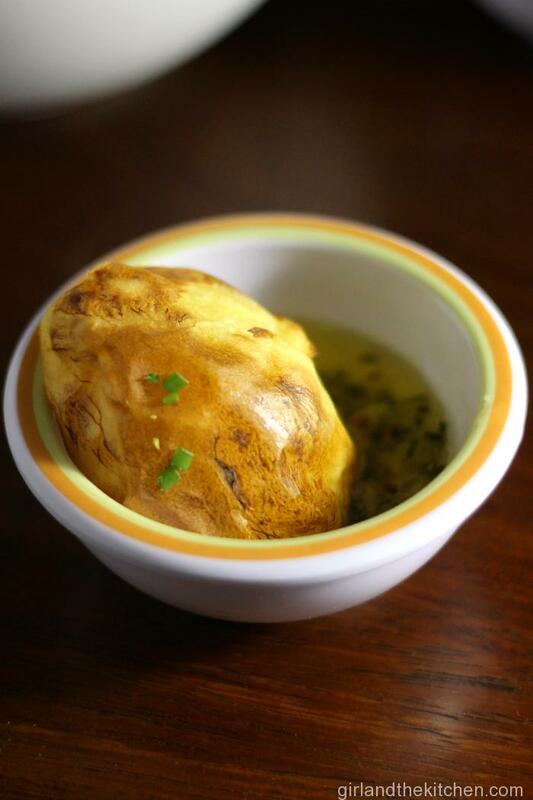 While the potatoes are roasting, place butter, garlic, chives and seasonings into a small pot. 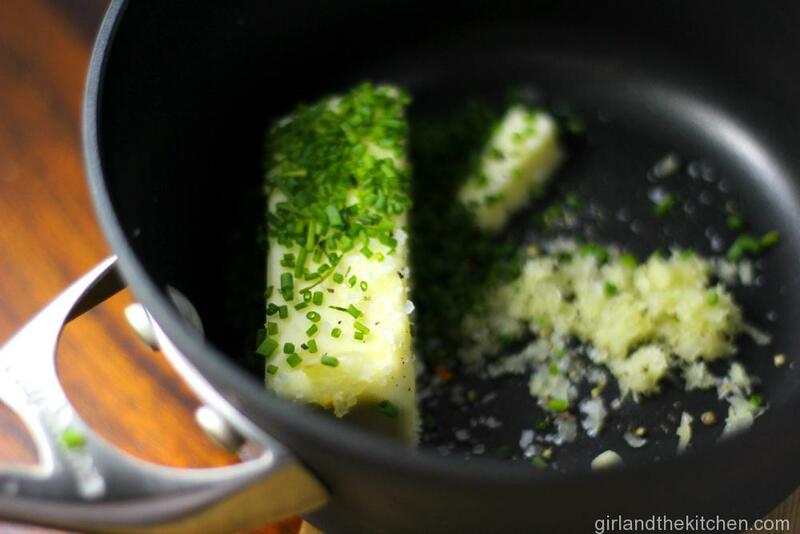 Over low heat, allow the butter to melt slowly and let all the flavors infuse the butter. This should take about 5 minutes. 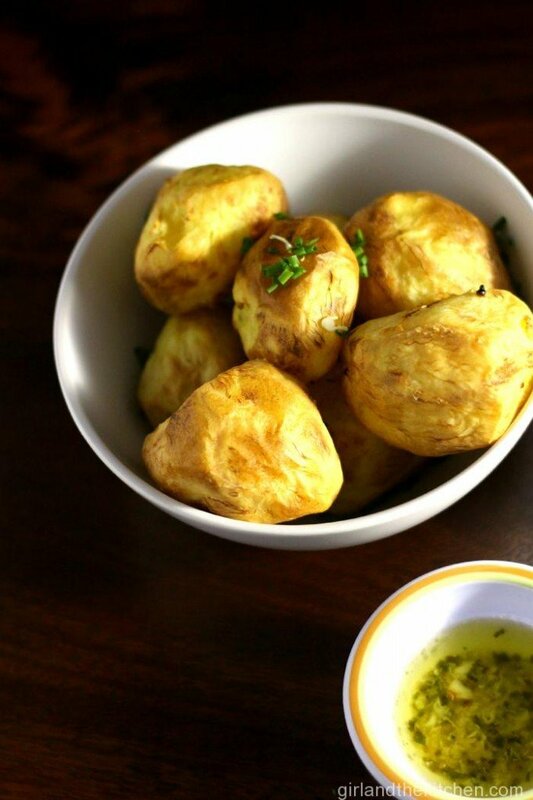 Once the potatoes are golden brown, remove and serve immediately with the garlic butter dip. Please note, if you are making these ahead of time, just take them out of the oven once they are ready and let them stay on the racks. Right before service, stick them back in the oven and allow them to crisp up again and they will be ready for you!